Zesty and savory enchilada with ooey gooey melty mexican cheeses but lightened up from the traditional enchilada. In 2 large casserole dishes spread 1 spoonful of salsa per pan, making sure to cover surface to prevent tortillas from sticking. In a small to med frying pan, heat about 1 cup of salsa verde until just warmed over med heat. Turn off heat. Meanwhile, using tongs grill a tortilla over med/high heat until slightly charred, about 30- 40 seconds per side. (see pictures above) Once tortilla is grilled dip into heated salsa. Turn tortilla to cover opposite side with salsa. Place salsa covered tortilla on a plate. Place about 1/4 cup of shredded chicken & a couple tbsp of each cheese down the center of the tortilla. Make sure to not overfill. Roll tortilla. Place in casserole pan with folded side down forming neat rows of enchiladas. Repeat with all tortillas. 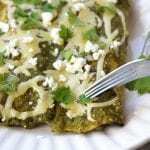 Once all enchiladas are rolled spoon additional salsa verde over the top and sprinkle with remaining cheese. Bake at 325℉ for 20 mins or until cheese is melted. If baking a whole chicken- add 2 hours onto preparation time. Preheat oven to 350℉. Rinse chicken and place in a casserole dish with breast side up. Drizzle with about 1 tbsp olive oil and sprinkle with salt. Bake for 60-70 mins or until it reaches an internal temperature of 165℉. Let cool for about 45 mins to 1 hour before deboning.